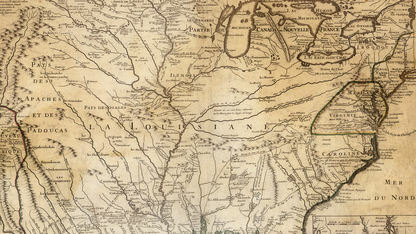 The English in the Carolina colony were aware of the French claims and explorations in the Mississippi Valley, and eagerly pushed west to establish trading relationships with as many tribes as they could. 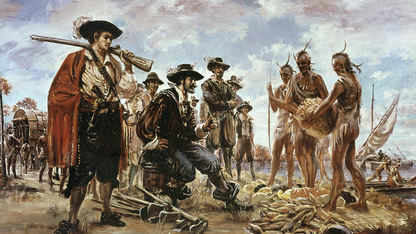 Dr. Henry Woodward may have established first English contact with the Chickasaws as early as 1685. By 1690 Carolina traders were in regular contact with the Chickasaws, bringing firearms, textiles, iron tools, glass beads, and more. What the traders demanded in return were Indian slaves they could run back to the colonies and sell for labor in the Caribbean sugarcane plantations. Many Chickasaw war captives suffered this fate. A general uprising in the Southeast known as the Yamassee War (1715) put an end to the wholesale Carolina Indian slave trade, but deerskins quickly became the choice commodity which the Chickasaws exported to Carolina for goods and supplies they could not produce. This economic shift, coupled with the powerful technology of firearms, fundamentally changed Chickasaw lifestyle and hunting patterns. Deer were now a commodity to be exploited for the valuable leather which could be made from their skins. Chickasaw hunters ranged farther, causing intertribal friction, and spent more and more time away from the villages in the winter. Chickasaw women also were charged with the laborious task of processing all the deerskins, a responsibility which took time away from other traditional crafts. 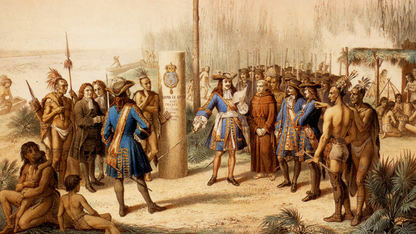 This was just one of the effects of increasing contact with the Europeans.